STUDENTS! Are you struggling to retain what you are studying? PARENTS! Help your struggling student with this learning resource! IMPROVING YOUR STUDY HABITS & RETAINING MORE INFORMATION IS AS EASY AS 1-2-3 ! 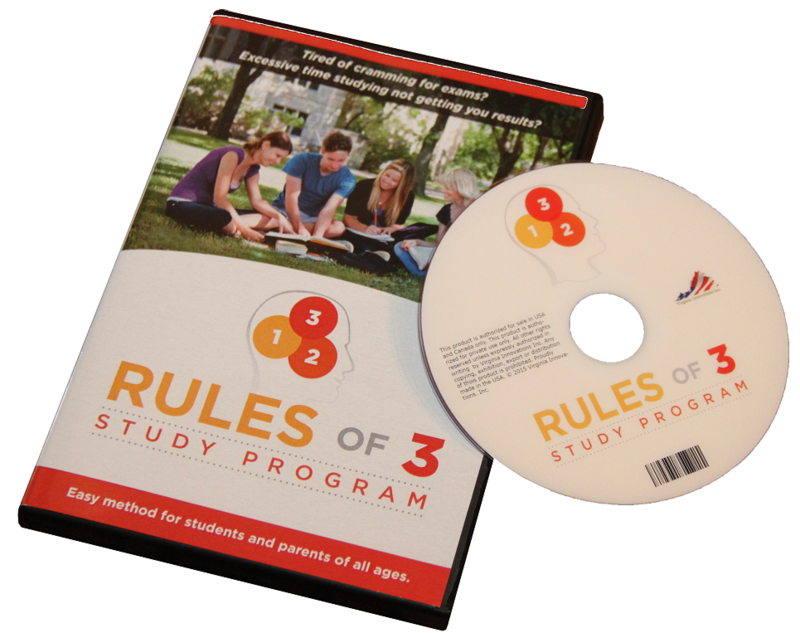 The Rules of 3 Study Program adds a structured step by step process to studying. It helps to maximize your comprehension of the material and minimize the study time. 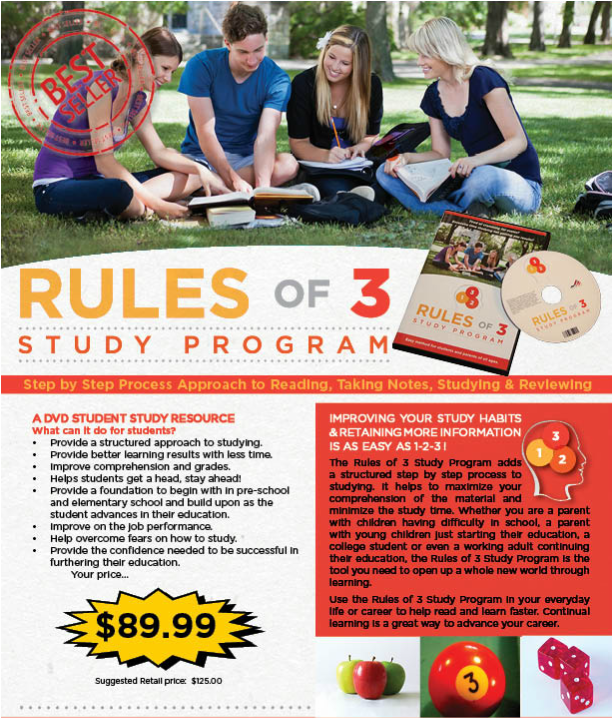 Whether you are a parent with children having difficulty in school, a parent with young children just starting their education, a college student or even a working adult continuing their education, the Rules of 3 Study Program is the tool you need to open up a whole new world through learning. 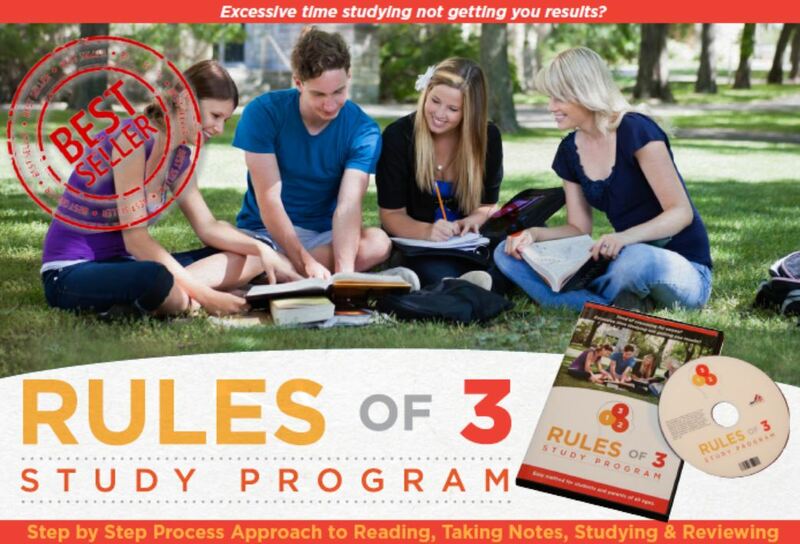 Use the Rules of 3 Study Program in your everyday life or career to help read and learn faster. Continual learning is a great way to advance your career. **$89.99 **Special Pricing for Final Act Drama Customers! Price includes tax! A Step by Step Process Approach to Reading, Taking Notes, Studying & Reviewing. This DVD video resource includes a handy insert containing the outlined program to get you started. ​What can it do for students? Provide a structured approach to studying. Provide better learning results with less time. Helps students get a head, stay ahead! Provide a foundation to begin with in pre-school and elementary school and build upon as the student advances in their education. Improve on the job performance. Help overcome fears on how to study. Provide the confidence needed to be successful in furthering their education. “I went from reading a paragraph and forgetting it to...I’ve got this whole chapter!” “It was really beneficial and I still use it today.” - Rhonda R.
​“This has helped me to be a better student.” - Annetta M.